Alfa Romeo Giulia arrived here in January 2017 with the arduous task of helping to resurrect the iconic Italian brand to the level that made it one of the world’s most respected carmakers. The Alfa Romeo 4C that went on sale in 2015 was certainly a positive sign but it was a small two-door coupe or convertible sportscar with limited impact on the general market. 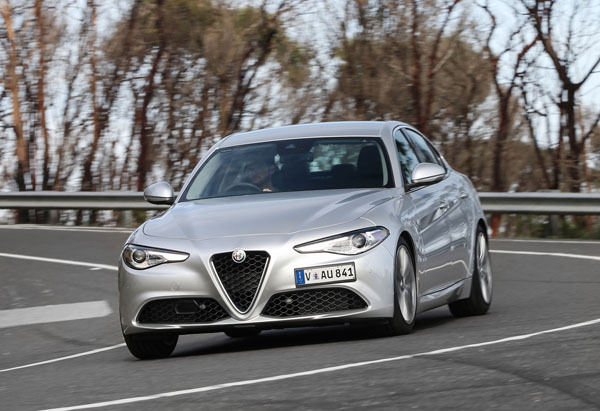 By contrast Giulia is a mid-sized family sedan albeit one with serious performance attributes. With SUVs dominating sales it’s getting harder and harder to find a motor vehicle that turns heads but Alfa’s Giulia is such a car. The front is spectacular with a large version of the traditional Alfa grille finished in a honeycomb pattern above large twin air intakes, also honeycomb. The interior is superbly crafted with genuine leather seats and a premium feel and look throughout. Four variants are offered: Giulia, Giulia Super (with petrol or diesel), Giulia Veloce and the high-performance Giulia Quadrifoglio. All come with the high levels of equipment that buyers would expect given prices that range from $59,895 to $143,900. The entry-level Alfa Giulia has eight-speed automatic transmission; leather upholstery; 18-inch alloy wheels, automatic bi-xenon headlamps, keyless entry and start/stop; dual-zone climate control; satellite navigation; automatic windscreen wipers; cruise control; rear parking sensors and a reversing camera. The two Giulia Super models add a higher grade of leather for both the seats and dashboard and upper door trim. There’s an eight-way powered driver’s seat; heated front seats and steering wheel; chromed door sill insert; ambient lighting package; and active cruise control with stop / go function. Veloce adds sports features including a body kit; rear bumper with diffuser and dual exhaust tips; 19-inch five-hole dark alloy wheels; upgraded brakes with red calipers; Alfa SDC adjustable suspension; gloss black window surrounds; privacy glass; bi-xenon headlights with Adaptive Front Lighting System; automatic high-beam control; powered sports leather seats with six settings and power bolsters; sports steering wheel; aluminium faced pedals; alluvium trim details; and a premium sound system. Giulia Quadrifoglio Verde (QV) has serious sports items that include a large central grille and air intakes, cooling slots on the bonnet, serious side skirts and aggressive rear diffusers. The entry level Giulia is powered by a turbo-petrol 2.0-litre four-cylinder engine producing 147kW and torque of 330 Nm from 1750 to 4000 revs. Fuel consumption is listed at just 6.0 litres per 100 kilometres. The Giulia Super comes with a choice of the same turbo-petrol engine as in the base model or a new-generation 2.2-litre, four-cylinder turbo-diesel with 132 kW, and 450Nm from 1750 to 3750 rpm. Giulia Veloce also uses the 2.0-litre turbo-petrol engine but here it’s re-tuned to 206kW and 400 Nm that take it to 100 km/h in 5.8 seconds. The 2.9-litre twin-turbo V6 in the Giulia Quadrifoglio Verde (QV) is something special with its Ferrari-inspired 500 horsepower (375 kW) twin-turbocharged engine. That peak power comes in at 6500 rpm with the redline set at 7000 revs. There’s an impressive 600 Nm all the way from 2500 to 5500 rpm. All engines are mated to an eight-speed ZF automatic gearbox. Passive safety features across the Giulia range include Forward Collision Warning (FCW), Autonomous Emergency Brake (AEB), pedestrian recognition, Integrated Brake System (IBS) and Lane Departure Warning (LDW). These, and the usual standard safety features combine to give Giulia the expected five-star EuroNCAP rating but with a 98 per cent protection result for adult occupants, the highest score ever achieved by any car to date. Our test car had cream carpets which looked great but seem sure to show up dirty marks. A small car vacuum cleaner carried in the boot is recommended. Talking of the boot, there’s a decent 480 litres of space although the loading area is on the small side and the interior shape makes it difficult to store large items. A 40:20:40 split-fold rear seatback that folds almost flat will help overcome this problem. The rear door openings are fairly small and taller passengers will need to do a bit of manoeuvringmanoeuvring to get inside. Once there legroom is adequate although some negotiations may need to take place between taller front and rear occupants. Headroom may be marginal for taller occupants. As good as the Giulia looks it’s also a brilliant car to drive. It’s a true sports model, with an all-new rear-wheel-drive architecture giving it 50:50 weight distribution. 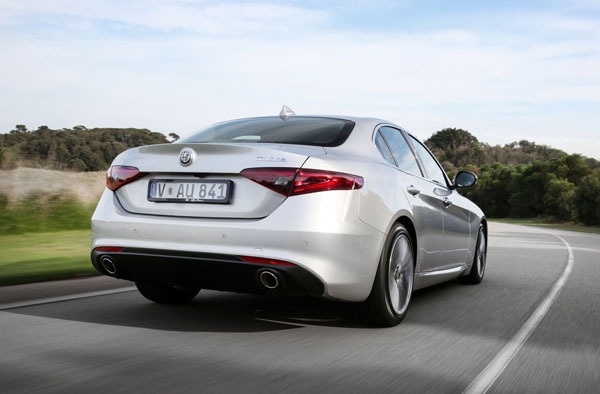 It’s the first Alfa sedan to be driven by its rear wheels since the early 1990s. Weight is kept down through the use of lightweight steel and composite materials such as carbon fibre. Like an increasing number of new vehicles Giulia comes with a start/stop button, many of which are annoyingly tucked away out of sight behind the steering wheel. Determined to be different the Alfa designers have positioned the button at the bottom of the steering wheel itself. At least it’s at the bottom once the driver gets into the habit of parking, as we all should, with the wheels pointing straight ahead. Giulia wouldn’t be a true Italian car without a few annoyances. The drinkholders are too small and require too much pushing and pulling to use. Also far too small is the windscreen wiper control which is tucked away behind the, contrastingly large, aluminium gearshift paddles. The driving position is lower than we normally like but Giulia is a sports sedan so that’s to be expected. But all that is forgotten when you get underway. A diesel-powered Alfa Romeo might seem like an odd couple but engine in our Super Diesel test car is so quiet as to be all but indistinguishable from a petrol. Acceleration is smooth and progressive. Steering is so fast and sharp that it takes a few minutes to adapt your driving to it before settling in to enjoy it. The suspension provides a nice balance between comfort and control. Fuel consumption is listed at a challenging 4.2 litres per 100 kilometres. We averaged a touch over six during our test. It’s not often that we get a real surprise with a new car but we certainly got it in spades with the new Alfa Romeo Giulia. Anyone who is in the market for a mid-sized sports sedan should forget all their pre-conceptions about Alfa and at least take it for a test drive before rushing in and buying one of its mostly German competitors. It’s a car with the character that you expect from Italy and that combines stunning looks with excellent performance – outstanding if you’re willing to double your investment for the QV. Note: These prices do not include government or dealer delivery charges. Contact your local Alfa Romeo dealer for drive-away prices.